James Harris Gallery is pleased to present our first solo exhibition with New York based artist Alyson Shotz. For over two decades, Shotz has been creating sculptural and installation work that engages with the physical properties of space over time. Working in diverse media such as paper, clay, digital imaging, metal, beading, glass, fiber and animation, Shotz creates novel perceptual experiences that interact with the surrounding environment. Without loyalty to a particular medium, material and form are secondary, deliberately employed to best communicate a particular concept or idea. Her artistic modes of production are unconventional, using chance processes of folding, dropping, crumpling, and threading that are in collaboration with her chosen materials. For this exhibition, Shotz takes over the entire gallery, presenting installation work, sculpture, mixed-media prints and video animation. Dealing with such phenomenological concerns as space, gravity, light, and entropy, Shotz harmonizes the static object with environments in flux, creating a transitory yet complete sensorial experience. In gallery two, the animation The Bedroom, Time Lapse depicts a digitized creation of Vincent Van Gogh’s Bedroom in Arles with music composed by Nasheet Waits, drummer and musician. Like the impressionist painter, Shotz has a similar interest in how light affects objects in space. The animation creates the natural phenomena of light coming through the bedroom window from day to night over seasons. 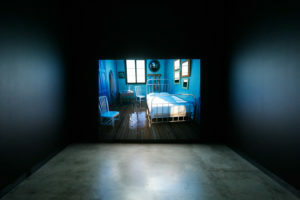 At one point the room becomes flooded, both a reference to Van Gogh’s original painting of The Bedroom being destroyed in a flood and to Shotz’ own experience of the destructive forces of nature when her studio flooded during Hurricane Sandy. The ominous and dreamlike tone, enhanced with Waits’ jazz composition, points to the sci-fi films of Kubrick’s 2001: A Space Odyssey(1968) and Tarkocsky’s Solaris (1972) that influence Shotz’ creation of an unearthly domestic space. This virtual room blurs the boundaries between illusion and reality and challenges her audience’s perceptual faculties to reorient to the environment and entice the imagination. Although the work is ultimately experiential, Shotz initially approaches each piece conceptually, starting with an idea that turns into an artistic experiment, a proposed hypothetical situation with an unknown outcome. She explores various conditions with diverse materials that best illustrate her ideas. 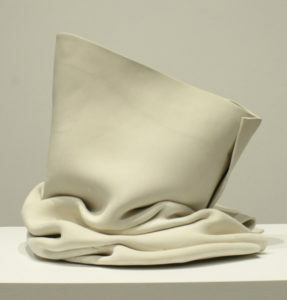 In gallery three, the ceramic work Recumbent Fold is part of a series that Shotz created using a methodical set of instructions to produce discrete forms of slumped over clay. 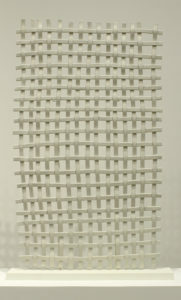 In this work, Shotz drops cylinder shaped unfired porcelain from varied heights and each resulting work is unique. Shotz sees this as a collaboration with natural forces and chance. The unique properties of clay, the thickness of the slab, the force of the drop, and the humidity in the air at that moment all participate in determining the works final shape. Also in gallery three, Laws of Motion is made in a similar manner, but then cast in bronze. 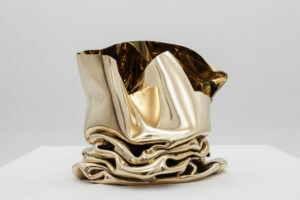 In this solid material, the work has a different tone, evoking more forceful processes of crushing the metal to create the crumpled form. 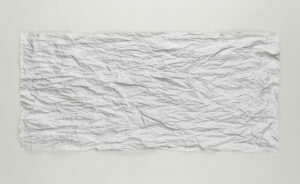 Both Recumbent Fold and Laws of Motion operate as relics of a process based event, and as sculptural objects that call attention to the current conditions of the physical surroundings as temporally removed from or perhaps still acting upon these pieces. Some ideas Shotz leaves unrealized allowing the work to remain theoretical. 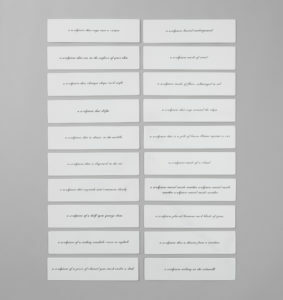 In a set of enamel wall mounts entitled Imaginary Sculptures, the artist proposes unique ideas for a sculpture that will never be created outside the minds of the artist or viewer. In this work, Shotz proposes such hypothetical sculptures as: “a sculpture that is elastic in the middle”, “a sculpture that changes shape each night” or “a sculpture that sits on the surface of your skin” and lets the activation happen purely in the mind. Although imaginary, this exercise brings awareness to the actual physical space of the viewer and in this sense, provides a sensorial recalibration. 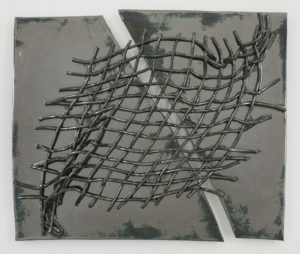 The Daughtsman’s Nets and the Broken Dark Earth wall works located in gallery three are transformational ceramic objects made from the chance processes of the kiln. The Broken Dark Earth works are created by letting porcelain slabs stretch and break within the heat of the kiln. 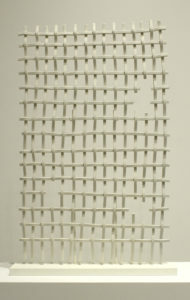 Woven porcelain “fabric” patches hold the broken pieces together to keep them from drifting farther apart. The shifting light interacts with the patterning of these patches and the surface quality, altering the color of each work and creating an ephemeral shadow layer onto the panels. The Daughtsman’s Nets similarly incorporates shadow as an immaterial yet perceptual element that shifts with the lighting. The title is taken from Durer’s 16th C drawing instrument in the shape of a net. The instrument gathered three-dimensional information from the world and translated for drawing on a two-dimensional surface. These sculptures are intended to hover between dimensions, blurring the boundaries of the material and the immaterial, ultimately revealing the properties of space itself. Topographic Iteration also plays with the translation between two and three dimensions. 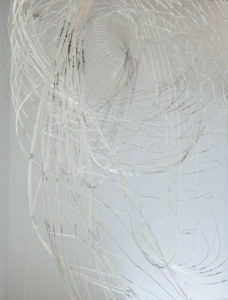 In this work, Shotz employed the technique of crumpling for its random and chaotic nature to give a two-dimensional piece of paper three-dimensional form. This form is then photographed, re-crumpled, and re-photographed. The physical textured object and the print are perceptually indistinguishable, calling into questions both representation and perception. The multiple iterations of this original act speak to both the inability to completely capture the artistic process faithfully and the endless permutations that are valid as representation. In this exhibition, Shotz pushes the boundaries of medium and physicality, expanding into the space and obliterating artistic framing devices. In this sense, there is an impossibility of consuming these works as finite art objects, rather they operate within a complex relational system of perception that has both a cognitive and experiential understanding. Creating unexpected and immersive experiences, Shotz’ work alters our sense of space and time, and allows us to see what is present. Shotz’ work will be included in the upcoming exhibition Art & Space at Guggenheim Museum Bilbao at the end of 2017, and her large outdoor work Scattering Screen is currently on view as part of Art in the Garden at Blue Star Contemporary Art, San Antonio, TX. She has had recent solo exhibitions at the Pennsylvania Academy of Fine Art, Philadelphia, PA; Halsey Institute of Contemporary Art, Charleston, SC; and Ruth and Elmer Wellin Museum, Hamilton College, Clinton, NY. Shotz was a Stanford University Research Fellow at the Arts Institute, Stanford University from 2014-2015. 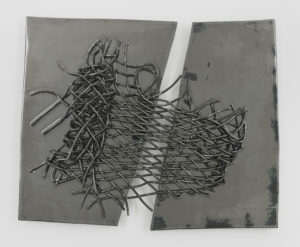 Her work is in numerous institutional collections including The Solomon R. Guggenheim Museum, New York, NY; Hirshhorn Museum and Sculpture Garden, Washington, DC; Indianapolis Museum of Art, Indianapolis, IN; Storm King Art Center, Mountainville, NY; and San Francisco Museum of Modern Art, San Francisco, CA. Shotz received her MFA from the University of Washington in 1991; she lives and works in Brooklyn, New York. 35 1/2" x 23" x 4"
39" x 24 1/4" x 4"
15 1/2" x 17 1/2" x 16"
16 1/2" x 20" x 19"
15 1/2" x 18" x 2"
17" x 19 1/2" x 2"
74" x 200" x 64"